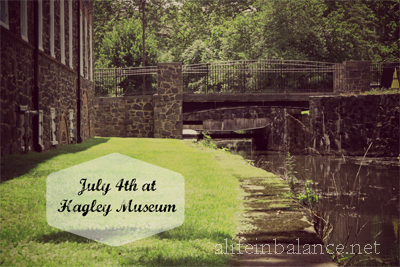 After our trip to Winterthur on July 4th, we decided to stop at Hagley Museum on the way back to Pennsylvania. I knew our Franklin Institute membership would get us in for free, however, I wasn’t sure what to expect since we’ve never visited Hagley. Having just come from the expansive and elegant Winterthur, the 20th century home of the DuPonts, it was a step back in time to visit Hagley and Eluetherian Mills where the DuPonts built their fortune first with supplying gunpowder, later dynamite, and even later expanding into other areas like nylon and plastics. 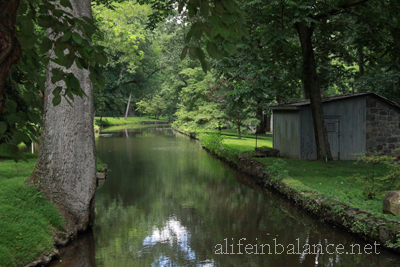 Hagley was much quieter than Winterthur; I think we all appreciated the slower pace and quiet afternoon. Located on the banks of the Brandywine River, E.I. DuPont built his gunpowder works here in 1802, expanding downstream from Eleutherian Mills. Hagley remained open until 1915. 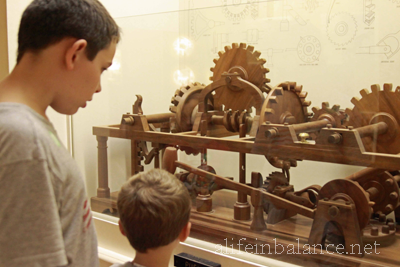 The kids and I started our visit in the Hagley Museum itself, wandering through the First Floor exhibit. Unfortunately, we never made it up to the 3rd Floor Hands-on area where Jeff Gordon’s race car is exhibited. Then it was out the back door to wait for the shuttle bus up to Eleutherian Mills, the first DuPont home in America. One of the gas-powered cars made by DuPont Motors. In the back is an electric car. Not featured is the Baby DuPont racer. 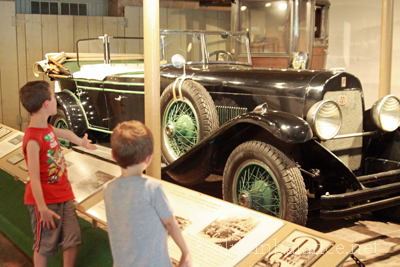 While at Eleutherian Mills, up the hill from Hagley, we of course had to check out the car collection in the lower part of the barn and the horse-drawn vehicles in the upper part of the barn. I never appreciated before how small the Conestoga wagons were for their massive voyage across the prairie; you’ll find one in the upper part of the barn. Next we took the shuttle bus back down to the Steam Engine House. 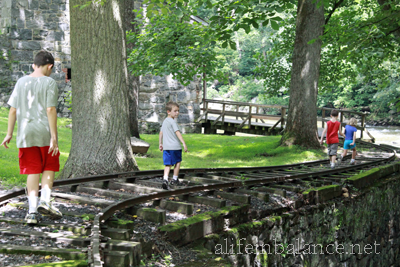 The steam engine first came to Hagley in about 1883 to supplement the water power provided by the Brandywine River. Used mostly during the spring rains or summer droughts, the steam engine provided power for the pack house just up the hill. 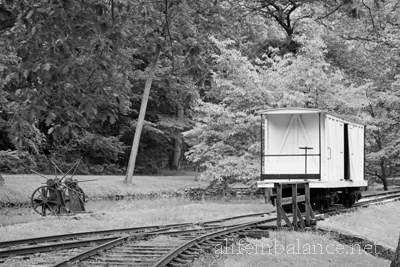 Workers at Hagley used this narrow-gauge railway to move supplies and other items between the various mills along the Brandywine. Nearby is a functioning paddle wheel. This area of Hagley is self-guided. Of course, the kids had to walk along the tracks and throw a few Pooh sticks and leaves in the river. We ended our visit with a stop at the “Easy Does It” exhibit. Focusing on the 4 simple machines, kids can ride an elevator, ride a bike, figure out how to load 50 lbs. in a wheelbarrow, and operate a stickshift for a car. 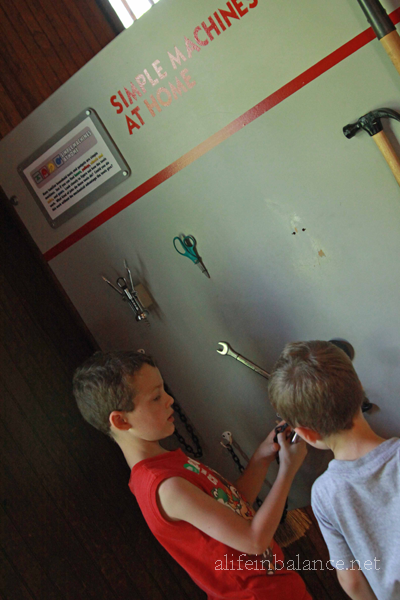 Plan on spending some time in here if you have budding engineers. Unfortunately, we never made it up the hill to see the foremans house and Sunday School or the nearby Power Plant. This area takes about an hour to explore. I think I know what I’ll be doing in August. Roadtrip!! What a great find! I didn’t know that this was down that way. Thanks for sharing! Oh, we will have to try this. My boys and husbands would love the old cars/train stuff! Just one husband…that was obviously a typo! That looks like a fun trip with the kids, esp the “easy does it” exhibit! Must check it out. Looks beautiful! It’s always nice to learn about more places to take trips, so thanks for sharing! I love Hagley. I had friend get married there a few years ago and it was gorgeous! Thanks for reminding me – we need to go check it out again with the kids! This place looks really neat – I’m definitely adding it to our list of local places to explore!